Gone are the days for that Filipino mentality that only the rich can travel. 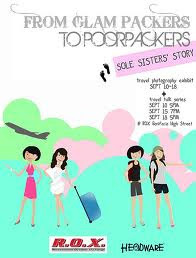 The Sole Sisters presents "From Glampacker to Poorpacker", a travel photography exhibit that will showcase their six-month backpacking trip in India and across Southeast Asia. The Sole Sisters will also introduce another side of travel: 'poorpacking' which is defined as independent, budget and adventure kind of.